Despite the towering mountains around Meran, the oldest part of the city is relatively flat and is easily walkable. 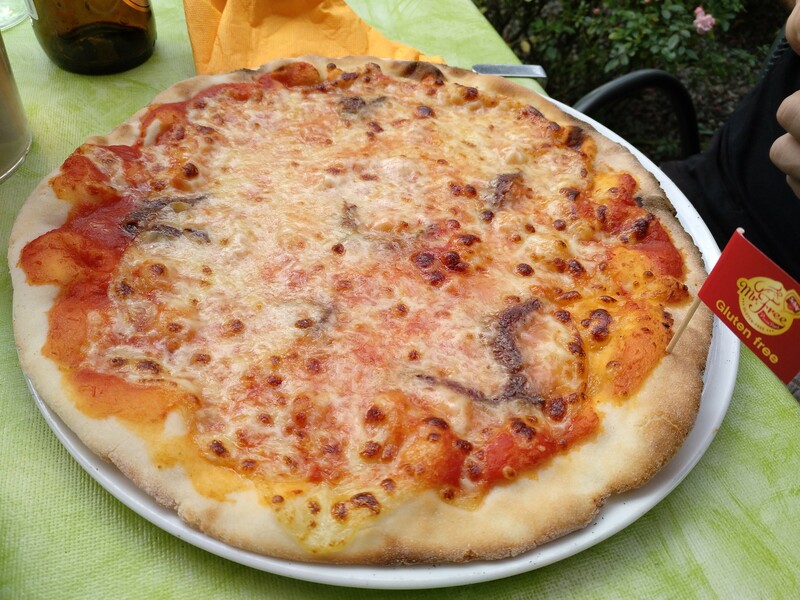 Upon arriving in Meran, we took a walk around the old town until we came to the take-out pizzeria Happy Pomodoro. Happy Pomodoro is not a fancy restaurant, it is really more of a take-out and delivery pizza joint – which suited us fine after travelling all day. The staff were incredibly welcoming, knew everything about gluten-free food and answered all of my questions about their pizza dough and how they prepare gluten-free pizzas. Most celiacs know the brand Schär, which is based out of Südtirol. Schär offers something called ‘Mr. 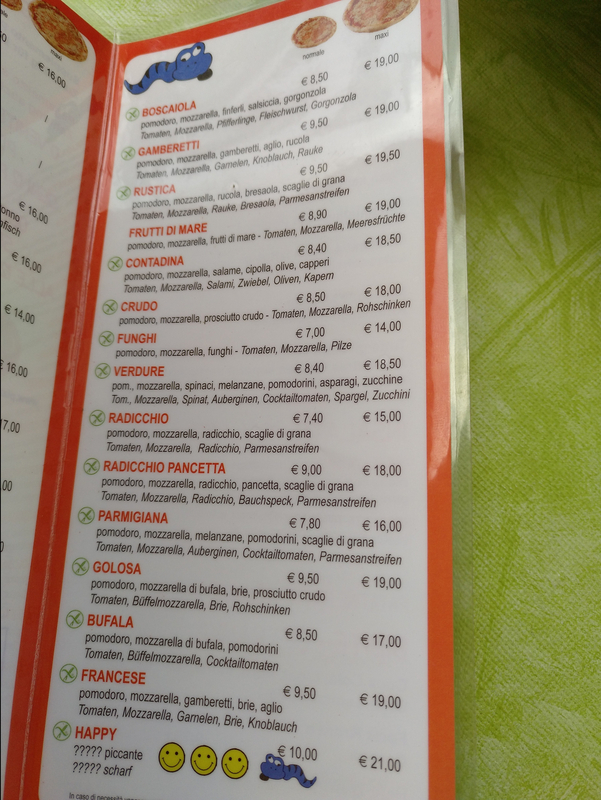 Free Pizza Point’ (Link in Italian) where the pizzerias can buy ready-made balls of gluten-free pizza dough. 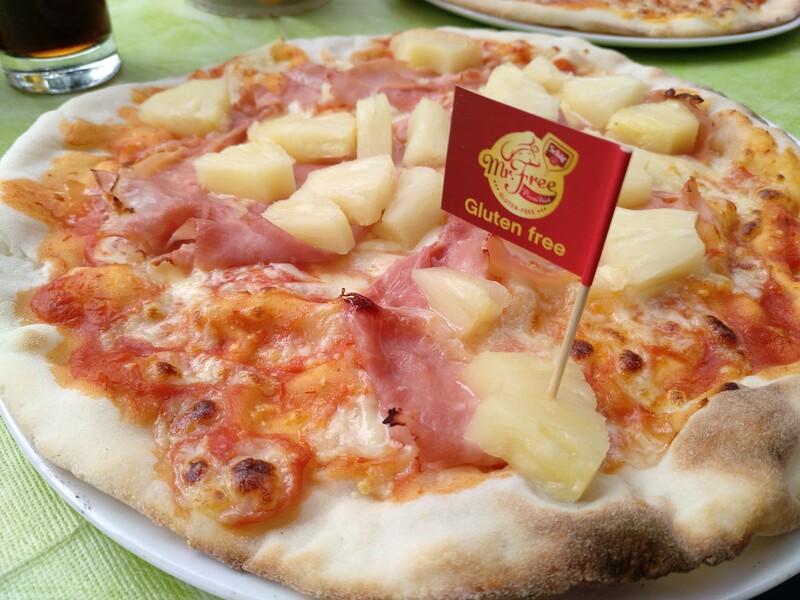 This dough is gluten-free and wheat-free, there is thankfully no gluten-free wheat starch involved! 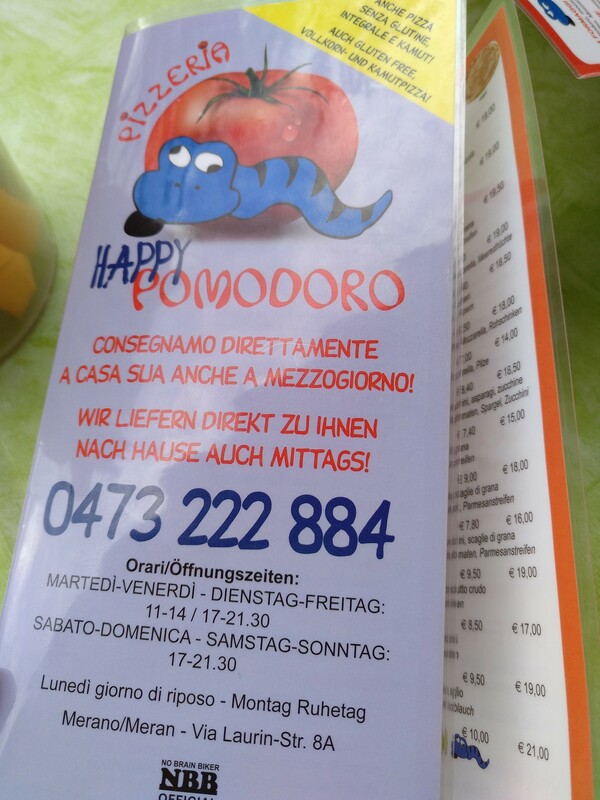 I double-checked at Happy Pomodoro, and the staff was more than willing to dig up the box and let me read the ingredients. 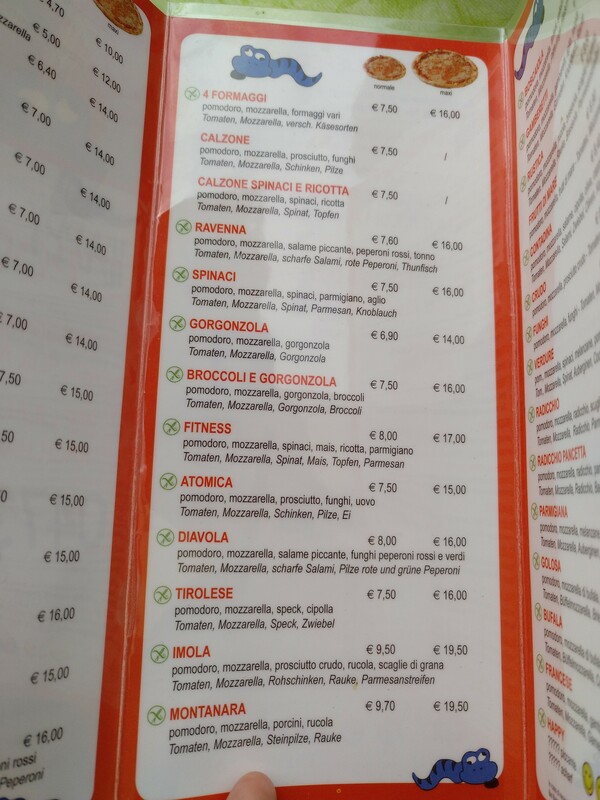 Pages of pizza options, almost all of them with gluten-free symbols. Heaven. I am also very intrigued by the ‘Happy’ pizza that just has question marks and ‘scharf!’ (spicy!) in the description. 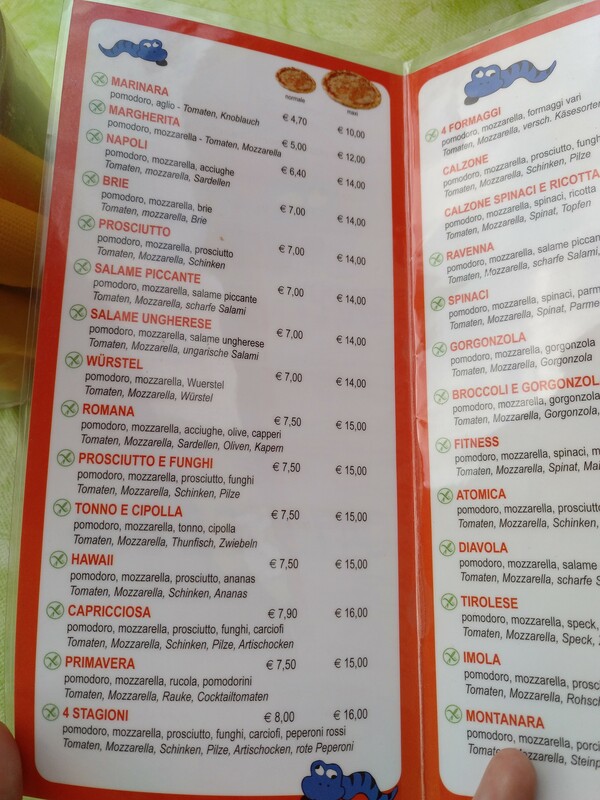 I think had we stayed in Meran longer, I would have gone back just to try the Happy surprise pizza. Look at these beauties. Napoli and Hawaii. 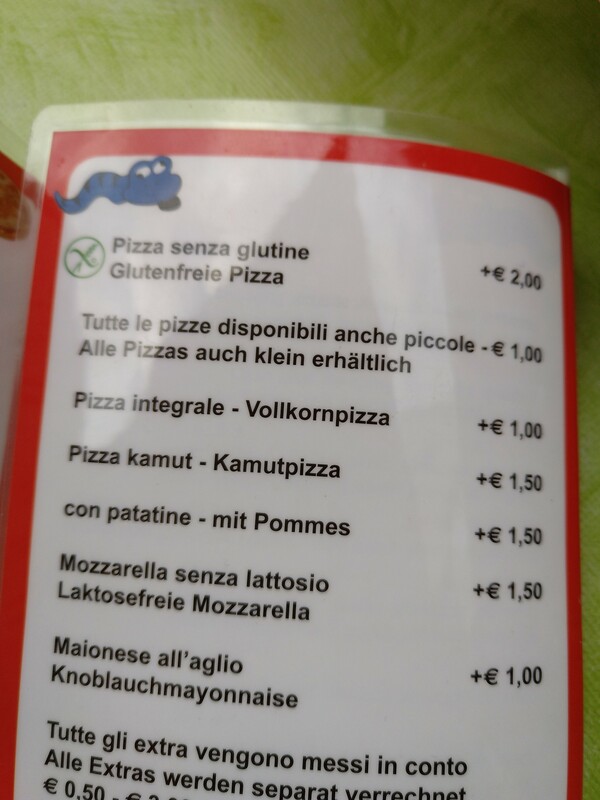 With the 2€ price on gluten-free pizzas, both pizzas were still under 10€ each. This means our total bill came out to less than 25€ and we were pleasantly stuffed. This was really good pizza. We would have gone again, actually my plan was to go at least twice, but they went on vacation the day after we arrived! Thankfully they mentioned this – somehow – on Google Maps (!) so we knew to go as soon as we arrived. As a note, Happy Pomodoro is certified by the AiC – the Associazione Italiana Celiachia. They have an app which is incredibly useful for finding nearby certified restaurants. Next up, the Botanical Gardens.